Unlike soil macrofauna (e.g., earthworms, termites, ants, some insect larvae), mesofauna generally do not have the ability to reshape the soil and, therefore, are forced to use existing pore spaces, cavities, or channels for locomotion within soil. Habitable pore space (voids of sufficient size and connectivity to support mesofauna) accounts for a small portion of total pore space (Hassink et al., 1993b). Microfaunal community composition becomes increasingly dominated by smaller animals as average pore volume decreases. Within the habitable pore space, microbial and mesofaunal activity is influenced by the balance between water and air. Maximum aerobic microbial activity occurs when 60% of the pore volume is filled with water (Linn and Doran, 1984). Saturation (waterlogging) and drought are detrimental to soil faunal communities because these conditions result in anaerobiosis or dehydration, respectively. Populations and diversity of mesofauna are greatest in soil with high porosity and organic matter, and structured horizons (Andren and Lagerlöf, 1983). Most biological activity occurs within the top 20 cm of soil which corresponds to the "plow layer" in agricultural soils. In uncultivated soil, mesofauna are more abundant in the top 5 cm than at greater depths in the soil. The organic horizon (O) is the area of accumulation of recognizable plant materials (high C:N ratio) and animal residues (low C:N ratio). The fermentation (F or Oj) layer consists of partially decomposed, mixed plant and animal debris permeated with hyphae of fungi and actinomycetes. The humus (H or O2) horizon contains amorphous products of decomposition with the source unrecognizable. Eventually, organic matter from these horizons becomes incorporated into the mineral soil profile. 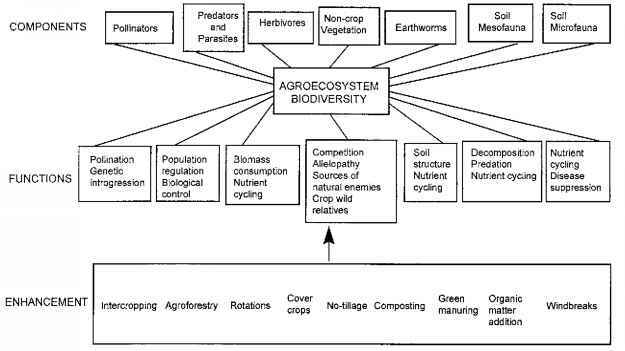 Because cultivated agricultural systems often lack a distinct organic layer on the surface, one might expect diversity of soil biota to be less than in uncultivated or no-till soils (House et al., 1984). Plants affect soil biota directly by generating inputs of organic matter above-and belowground and indirectly by the physical effects of shading, soil protection, and water and nutrient uptake by roots. Energy and nutrients obtained by plants eventually become incorporated in detritus which provide the resource base of a complex soil food web. Plant roots also exude amino acids and sugars which serve as a food source for microorganisms (Curl and Truelove, 1986). Soil mesofauna are often aggregated spatially which is probably indicative of the distribution of favored resources, such as plant roots and organic debris (Swift et al., 1979; Goodell and Ferris, 1980; Barker and Campbell, 1981; Noe and Campbell, 1985).